During 2018 Running Past has covered several of the leading suffragettes who lived in Lewisham with posts on Clara Lambert, Eugenia Bouvier and Caroline Townsend along with an update on the post on May Billinghurst. 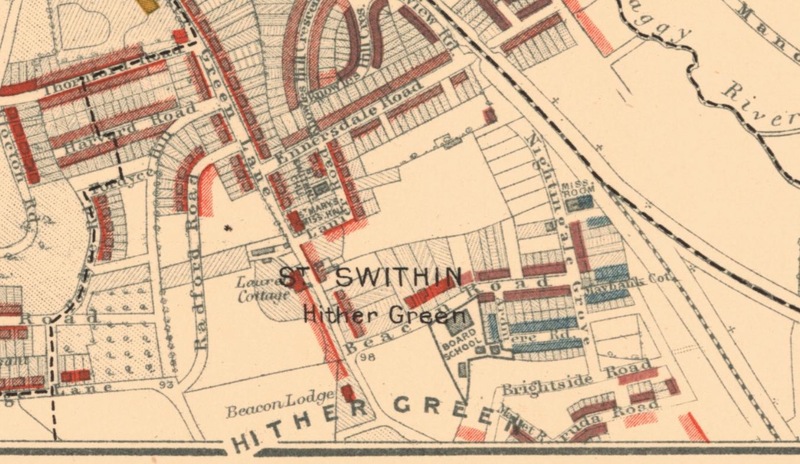 This post seeks to bring together some of the other suffragette and suffragist activity in Lee and Hither Green that hasn’t been covered so far, it will be followed by a similar one on Lewisham and possibly one for Blackheath too before the year is out. There were occasional public meetings at Lee Green, seemingly outside including one addressed Nancy Lightman in July 1908 (1), Lightman (pictured – 2) was a teacher who regularly appeared on Women’s Social and Political Union (WSPU) platforms, particularly in the early days of the campaign – she spoke at a large suffragette demonstration held in Hyde Park on 21 June 1908. A later one was addressed by a Mrs Brailsford on 4 October 1910 who gave ‘a most interesting address’; her name appears a lot in reports of local activity so she was probably a member of the Lewisham WSPU branch (3). One of the regular features of the WSPU campaign in Lee and Hither Green, and elsewhere, were attacks on pillar boxes. They were targets because they were seen as an obvious institutions of the state, resplendent with the mark of the Monarch and would disproportionately impact on the wealthy, business and the Government who were denying women the vote. May Billinghurst’s conviction for a ‘pillar box outrage’ in December 1912 has already been covered in Running Past; the same evening as she was arrested pillar boxes attacked in Beacon Road, Staplehurst Road (then probably on the corner of Leahurst, where the post office was then located and Northbrook Road – all between 6:30 and 7:30 pm – with tar being placed inside. While The Suffragette reported two arrests this was presumably May Billinghurst and Grace Michell – no one seems to have been charged for the Lee and Hither Green ones (4). The original Victorian Beacon Road pillar box attacked is still there at the junction with Hither Green Lane (see above). I did suggest to Royal Mail, that it might be appropriate to paint it in suffragette colours of purple, green and white – sadly, their courteous response declined the request. In early 1913 there were further reports of ‘pillar box outrages’ outside 124 Burnt Ash Road (almost opposite Upwood Road) which had a copy of ‘The Suffragette’ posted into it, along with another at the junction of Manor Park and Northbrook Road (5) – below. There were reports of further attacks on post boxes in unspecified locations in Lewisham and Hither Green later in the year on 26 October (6). Late in 1913 wax vesta matches and gunpowder were found in the post box in an unspecified location in Lee High Road but they failed to explode (7). At the other end of the spectrum of suffrage and suffragette activity was the likely burning down of a cricket pavilion in Lee. Suffragettes had started attacking sports facilities in early 1913 after Asquith’s Government had rejected demands for Votes for Women; it marked an extension on the damage to property of the window smashing campaigns. The pavilions, golf clubs and the like attacked tended to be those not allowing woman members and left unattended for long periods. In January 1914 the Northbrook Cricket Club pavilion was burned down – it was somewhat ironically located just off Burnt Ash Road, next to the railway – its pavilion was mid-way along what is now Holme Lacey Road (10). Press reports nationally in ‘The Times’ were circumspect about who or what was responsible, noting that ‘nothing was found to support the theory that suffragists were responsible’ (11). Elsewhere though there were strong indications that it was the work of the WSPU; the Daily Herald merely reported the fire not mentioning any possible cause or culprit – however, they carefully juxtaposed the report with an advert for the paper’s ‘Suffrage Week’ which was to start a few days later (12). While responsibility was not directly claimed for the blaze either locally or nationally, it was covered as part of a series of reports in that week’s ‘The Suffragette’ (see bottom right hand corner below) headed ‘Fires and Bombs as Answer to Forcible Feeding’ – so the implication about the cause of the fire was pretty clear (13). While as noted above the arson attacks on pavilions tended to be on buildings left unattended for long periods, there may have been an added ‘incentive’ in this case – the club was named after previous Lords of the manor and major landowners – the Northbrooks, who were Liberals in the House of Lords, the then Baronet having been a Liberal MP before succeeding to the Earldom in 1904. Oddly, it wasn’t the first time the pavilion had burned down – there had been a major fire there in the early 1890s (14). No one was every arrested or charged with the fire. In terms of the activists in Lee there were a three households that were really important in the struggle for votes in Lee – the Townsends who lived at 27 Murillo Road on what was then referred to as The Firs estate. One of the sisters, Caroline Townsend was covered in a post in early 2018. The second was 62 Manor Park – this was home to the Leighs – John, a Canadian, and Eda an American had 4 daughters and a son, the adult daughters in the 1911 census included Cornelia, 20, and Gladys, 18. One of these two, probably Cornelia, generally known as ‘Nellie’, organised the sale of ‘The Suffragette’ (15) and its earlier incarnation, ‘Votes for Women’ (16) in Lewisham for much of the time it was produced, it isn’t totally clear though as she was just referred to a ‘Miss Leigh’ – however, ‘Nellie’ appeared in a photograph of branch activists in 1913. It was presumably Nellie who organised jumble sale collections too (17). Nellie was to live in Lewisham until her death in 1977, Gladys died in Sussex the year before. There was presumably at least tactic support for the cause of women’s suffrage from John and Eda, as the house was used for displaying the new Lewisham banner in July 1913 (18). Saturday rallies were held there too from the spring of 1913 (19). It is possible that Eda Leigh was a regular speaker in the early days of the campaign – a Mrs Leigh is frequently mentioned giving speeches in the area – including one in Catford in August 1910 (20). However, the speaker is much more likely to be Mary Leigh. A ‘Mrs Leigh’ was also involved in the day to day activity in the branch; she was more likely to have been Eda from Manor Park rather than Mary though. The other family was the Llewhellin’s of 114 Burnt Ash Hill, above, a house probably built by John Pound. The parents were Arthur Jones Llewhellin, the mother was Sarah Jane (nee Thomas) – both were from Pembroke Dock in south west Wales, where they married in 1873. Arthur worked for the Inland Revenue and the family moved around a lot with children being born in Dublin, the Potteries, Malvern, Greenwich and Lewisham (Olive). In terms of the local WSPU branch both Sarah and more particularly Olive were active members. Sarah was widowed in 1906 and living on her own means in the 1911 census. Sarah was mentioned several time in ‘The Suffragette’ for donations, producing food for sale and catering, including for the Annual Branch meeting in 1912 (21). Olive was one of many suffragettes who refused to register in the 1911 census. Olive’s activity was a mixture of militancy and organisation. She was arrested twice – the first time was with Clara Lambert in late January 1913 after smashing the windows of the Hamburg American Line in Cockspur Street off Trafalgar Square. While Olive was remanded in custody, unlike Clara, she was later discharged (22). She was also arrested as part of protest by the Cymric Suffrage Union, which she was also a member of, due to her Welsh ancestry, when Lloyd George refused to see a deputation (23). Olive was the driving force behind the Lewisham WSPU banner, above, (24) – she had designed a well-received poster for the office window in 1912 (25). This seems to have led to her designing the banner (26) and being in charge of the fundraising for it (27). She is pictured bottom right below, with Caroline Townsend to the left; above her to the left is Clara Lambert and a Miss Warwick to the right (28). Olive was Branch Treasurer from early 1913 (29) and briefly acted as Branch Secretary in mid-1913 (30). She was an occasional speaker at public meetings held most Sunday evenings at 7:00 in Lewisham Market – such as on Sunday 21 September when she spoke with Eugenia Bouvier (31). Olive became a teacher, registering in 1927, when she was living in Stockwell. She was living in Poole in Dorset in 1939, she later returned to London –she died in Wandsworth in 1972. Picture copyright is held by the Museum of London, but use is allowed for non-commercial research purposes such as Running Past. The banner is part of the collection of the Museum of London, as is the photograph who allow its use for non-commercial research such as this. This entry was posted in Lewisham History, Rebels & Radicals and tagged Arson, Caroline Townsend, Hither Green, Lee, Lee Green, Northbrook Cricket Club, Olive Llewhellin, Pillar box attacks, suffragettes on September 6, 2018 by Paul B. 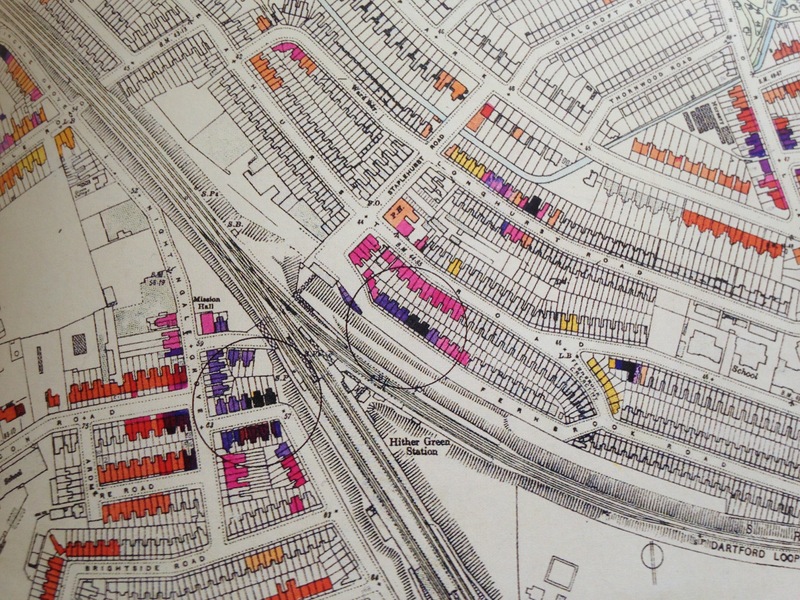 Last week’s post left explored the early years of Ardmere Road, looking at who lived there, the poverty and low-level crime. We return to the street just before World War Two when the 1939 Register, a mini census for rationing and related purposes, was collected in September of that year. When we had ‘visited’ for the 1901 Census, a small majority of the small three bedroom houses were home to two households sharing with an average of almost 8 people per home in the street. By 1939, the number of households sharing was down to 1 in 5 and the average number of people living in each house had almost halved to 4.3 – the reason for this lies almost certainly lies with the evacuation of children from London which had happened a month earlier. In 1901 there were 108 children, in 1939 just 7. Employment on the street although it was less dominated by the building trade than it had been at the beginning of the 20th century, it was still dominated by largely unskilled manual work with lots of general labourers, several dustmen. There was some semi-skilled and skilled manual work – such as the husband of one of the shopkeepers who was a telephone engineer and a couple of bricklayers; however, these were real exceptions. Because the 1939 Register was done for rationing purposes – a significant number of the men had the suffix or prefix to their trade of ‘Heavy Work’ which entitled them to extra rations. Such as ‘Builder’s Labourer – Heavy Work,’ slightly under half of the workers fell into this category. World War 2 saw changes to the physical structure of the street – much of this damage was caused by a V1 attack on 29 June 1944 (which will be returned to at some point in Running Past), as well as a high explosive bomb that was dropped during the Blitz. The map below (1) shows the combined extent of the damage – as the key shows the darker the colour, the worse the damage. The position was slightly worse than the LCC map showed as when the Ordnance Survey cartographers visited around 1950 numbers 20 and 21 were showing as ‘ruins’ (2). 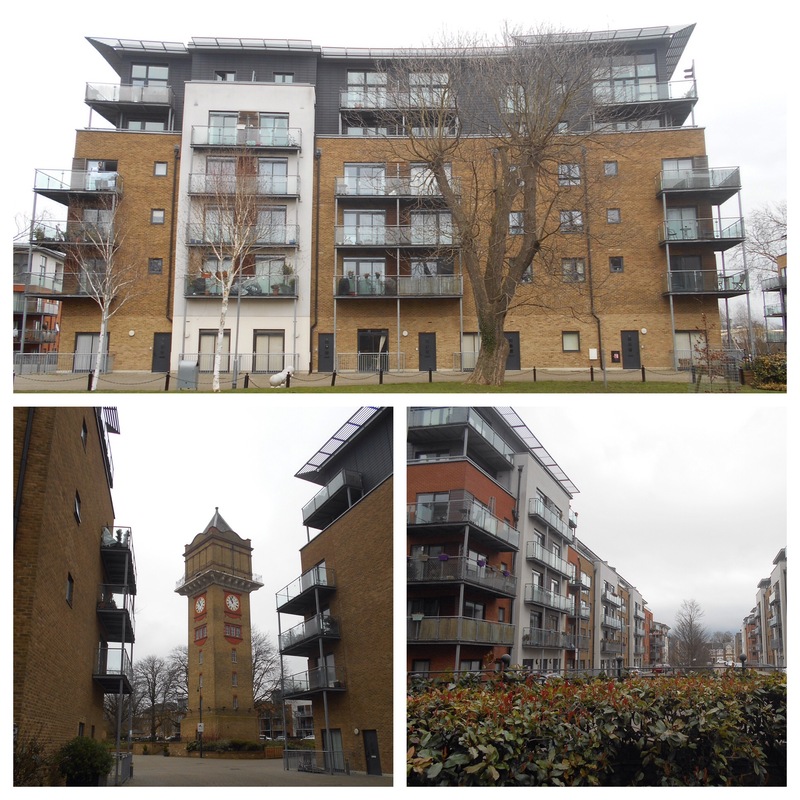 This site was redeveloped by the old Borough of Lewisham after the war as Council housing. In the end, while 10 to 14 were left standing, they too ended up being demolished. 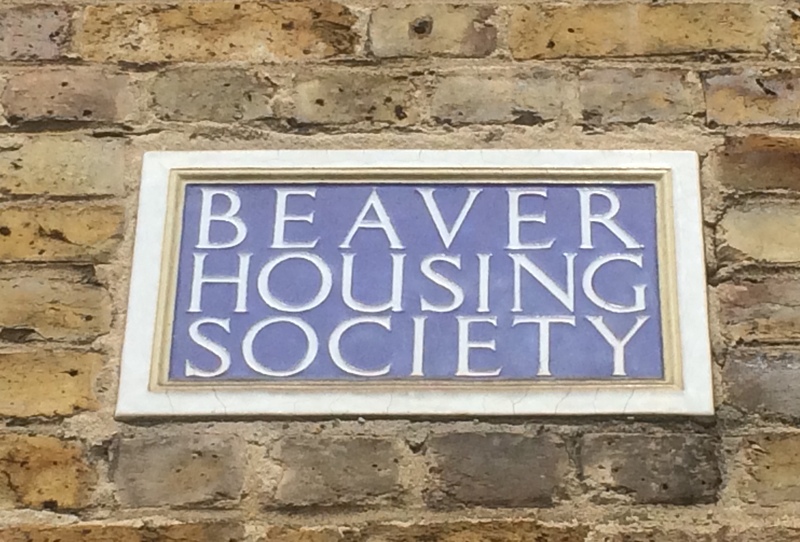 In this case it was Beaver Housing Society rather than council that built the new homes which were of a style that was closer to the original homes that those built by the Council. They had certainly been built by the early 1950s. Beaver was a Lewisham-based housing association that managed about 3000 homes, mainly in Lewisham and Greenwich. It ran its operations from Lewisham High Street – next to the former location of Kings Hall cinema – before moving to behind to Kings Hall Mews during the 1990s. They ran into serious problems with their governance in the early 2000s and merged with London & Quadrant Housing Trust, generally known as L&Q, in 2004. Their name disappeared soon after. 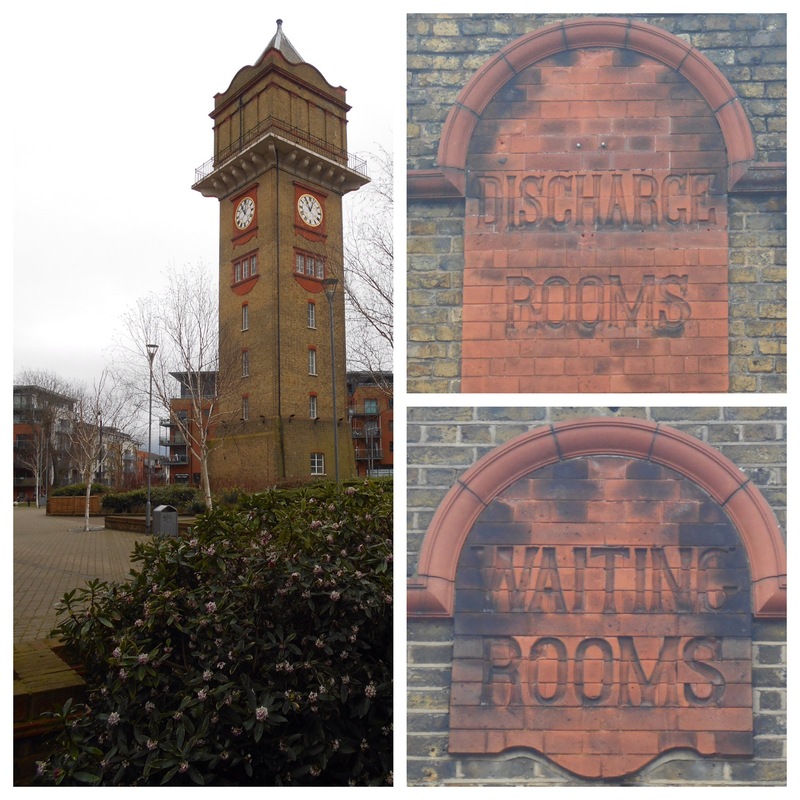 They inserted the small glazed tile into many of their developments, there is another just around the corner in Nightingale Grove which was developed at the same time – along with one on an impressive Grade II listed building on Croom’s Hill in Greenwich. In the first part of the story we noted that there had been an attempt by William Barrett to turn 17 from an off licence to a pub. The plans for creating up pub seem to have dried up, but William Barrett was certainly running the off-licence well into the 1920s based on Kelly’s Directories (3). William died in 1929 and his wife, Fanny, in 1933. By this stage, the licence was taken over by one of their daughters Winifred (“Winnie”) Amy Agnes Barrett. Winnie was born in 1903 when the family had already been running the off licence at 17 for 6 years. She was born into the trade and in all likelihood working in it from the age of 16 – certainly that was the legal age for consumption of alcohol in 1919. She was listed in the 1939 Register as a Licensed Victualler, which she ran with her cousin, Grace Baker, and later Kelly’s Post Office Directories have her running the off licence until 1979. The business seems to have been taken over by W Inkin in 1982, but didn’t last more than a couple of years longer (4). It is difficult to imagine now a small corner shop off-licence remaining in the hands of the same family for 82 years. There were memories of Winnie and being sent to the off licence to buy rolling tobacco and cigarette papers on a Facebook thread on the first post. 17 has now been converted into a pair of flats. Next door at number 18, the numbering on Ardmere Road is consecutive, was another shop that lasted a long time in the same family – Edith May’s grocers. She seems to have started as an assistant to & servant for Mary Law who was running the shop by 1911, taking over from Thomas Dixon who had been there since around 1905. Edith, then Coles, was 18 then having been born in late 1892. Edith married William May in Whitechapel in 1920. Mary Law ran the grocers until around 1924 when the Mays took over (5). In the Kelly’s Directories Edward May is listed as the proprietor from the mid-1920s until around 1941 (6). Given that he was listed as a Telephone Engineer in the 1939 Register the reality was that it was probably Edith’s business. During the war the grocers was where lots of local homes were registered to for their rations. ….frozen in time. Old marble counters, wooden single drawer for a till, flagstone floor, shelves with doilies and a huge brass scales. Edith May ran the shop until about 1980, having been involved with the shop for around 70 years. The shop was taken over by someone called Bobins around 1982, but like Winnie Barrett’s off-licence, it didn’t last long in new ownership (7). The shop front has gone and unlike next door there is little evidence from the outside of retail past (see below). So what about the street now? Census data remains confidential for about a century although some anonymised data is made available to researchers much sooner. However, it is possible to look at summary data on a variety of questions for quite small areas known as Output Areas. Data for Ardmere Road is available together with the neighbouring Brightside and Elthruda Roads. As would be expected, employment patterns have changed a lot since 1939. The big areas of employment in Ardmere Road’s Output Area are retail and wholesale (18%); education (11%); health and social work (10%), information and communication (10%) and construction (8%). These are relatively similar to Lewisham as a whole although more work in retail, manufacturing, construction and information, with slightly less in most other areas. As for housing, of the 274 homes in the Output Area, 123 are owner occupied with 151 rented or shared ownership. The average number of people per home were 2.55 – while lower than in 1939, this reflects as much that houses have been subdivided into flats. 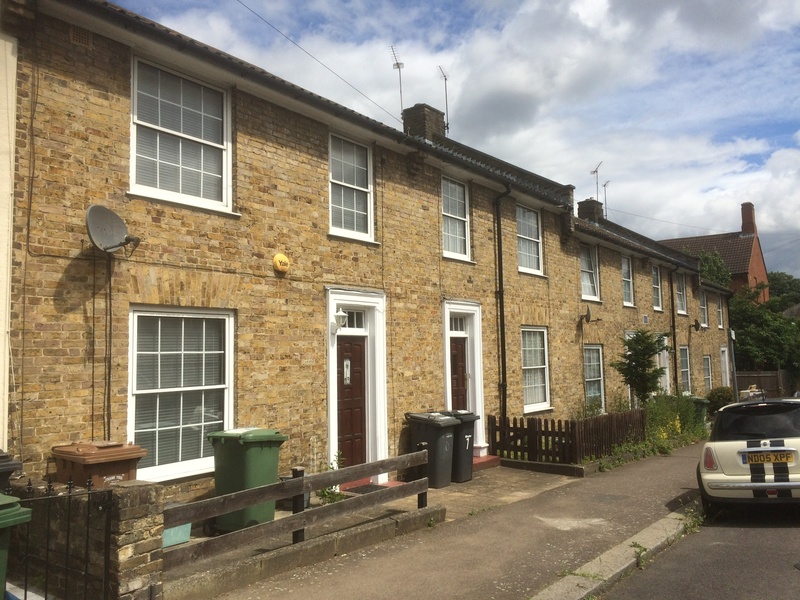 Rent levels will vary depending on the type of landlord – with the suggested private rents in the region of £1250 a month, but the social housing owned by Lewisham Council and L&Q considerably cheaper but still a lot more expensive. This is somewhat more that the 45p a week charged in 1907, even taking account of inflation. As for sold house prices , two houses albeit tenanted were sold for just £140 in 1908 (8). The most recent house sold was for £480,000 in September 2015, and a valuation now would probably be around £517,000. The two bedroom houses (where the third bedroom is turned into a bathroom) are a bit cheaper. As for the ‘shoddy building’ described by Charles Booth’s researcher, other than the World War 2 damage, the houses (from the outside at least) seem to have stood the test of time better than many in the area. Thank you to Julie Robinson at Lewisham Archives help on the later Directories and to Helen Holland for her memories of Mrs May’s grocers shop. This entry was posted in Lewisham History and tagged Ardmere Road, Hither Green on June 27, 2018 by Paul B.
Ardmere Road in Hither Green is a quiet residential street of smaller Victorian terraced houses with some post Second World War bomb damage replacement homes; it is older than the homes to the south and predates the arrival of the station by around 15 years. One of the fuller streets, shoddy building, two families the rule. Charles Booth conducted an ‘Inquiry into Life and Labour in London’ between 1886 and 1903 – for much of the city he produced wonderfully detailed maps coloured on the basis of income and the social class of its inhabitants. His assessment was based on walks carried out either himself or through a team of social investigators, like Aves, often with clergymen or the police, listening, observing what he saw and talking to people he met on the road. The observations were part of a longer walk by Ernest Aves that took in much of the Corbett estate which was being built. The extract of the map below is available from London School of Economics as a Creative Commons. So was Aves right about the street? The 1901 census was carried out a couple of years after Aves visited Hither Green, so the street was unlikely to have changed that much. The census showed two households in each house were the just the majority, in 16/30 houses – with an average of 7.8 people living in the small three bedroom houses – the highest being 12. There were a couple of shops – a grocer at 18 and an off-licence beer shop at 17. All were manual labourers except for the Police Constable at 9, and you could probably make the case for PC Davies being a manual worker too. A disproportionate number of the men worked in the building trade – some of these will have worked for Cameron Corbett’s contractors in the development of the Corbett Estate. 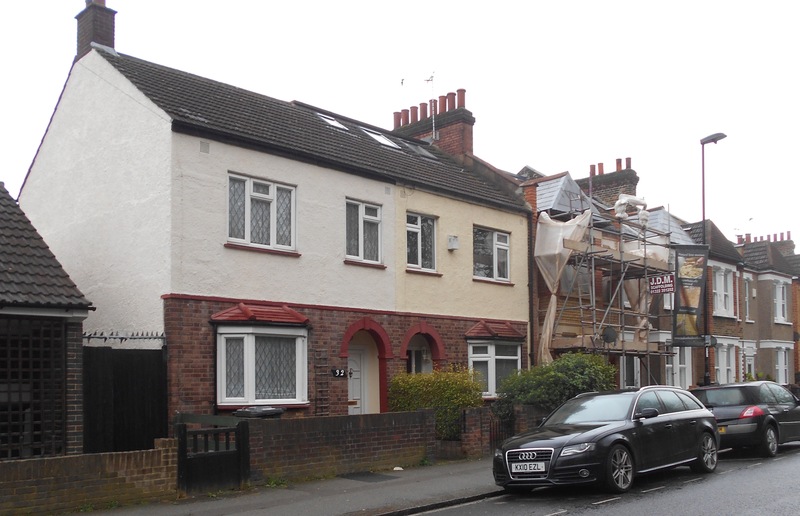 While Corbett initially rented out some of the smaller houses on his estate to building workers – notably in Sandhurst Road – this probably wasn’t sufficient. A lot of the women worked – 8 were laundresses taking in washing for the wealthier households in the streets around – although some may have worked at laundries; there were a trio of charwomen and a couple of dressmakers. In the early years of the street rent levels were low – around five years after they were built they were being offered for rent as ‘seven roomed houses, in good locality, bay windows, forecourt, rent 7s per week’ – that’s 35p for those without pre-decimal knowledge (2). Rent levels seem to have slightly reduced in the next decade – 21-32 were sold in 1894 as the owner was bankrupt – a couple of hundred properties across London were sold at the same time. The advertised rent level at Ardmere Road would have averaged 31p a week (3). A decade later, when there were further sales, rents had gone up significantly – at 21, 22 and 23 they were 9/- (45p), 8/6d and 9/- respectively. Whereas at 4 and 5 they were more expensive at 10/-. A few hundred metres away on similar sized houses on Ennersdale Road houses were offered at 13/- a week (4). The rent increases probably related to the opening of the station at Hither Green. 21 – 23 were sold again in 1907 – rents hadn’t changed though (5). The tenanted value of the houses was around £140 – based on the sale of an unspecified pair of properties in 1908 (6). 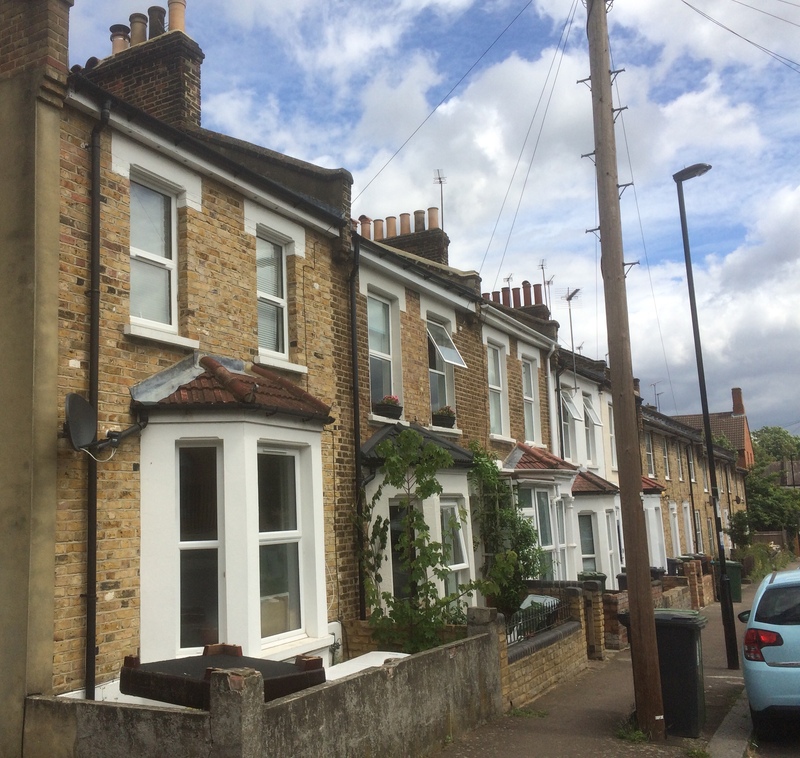 The trio of 21-23 Ardmere Road homes was again sold just before the outbreak of World War 1 – rent levels had declined slightly to 8/6d. The freeholds of most of the street were sold at the same time (7). Perhaps part of the reason for the frequent changing of hands were difficulties in collecting the rent. There was a case of claim and counterclaim at the Police Court in 1897. One of the tenants was alleged to have assaulted the rent collector by hitting him with a chair. The rent collector, who described himself a clergyman of the Church of England, was witnessed to having used language and behaviour that would not been heard coming from the pulpit – calling the tenant a ‘dirty cow’ and then attempting to strangle her after she only offered him 10/- towards rent (and presumably arrears). Both cases thrown out by the Police Court (8). There was lots of low level crime relating to the street – the O’Connor brothers at 30 appeared several times in court. Hugh was described as a ‘bad lad’ after stealing a ‘whip from a trap’ in Ardmere Road in 1890 (9). He was again in court in 1894 after stealing tinned fruit from a shop on Ennersdale Road (10); younger brother Michael was convicted of stealing from orchard in Nightingale Grove and was remanded for a week the following year (11). There were a couple of dozen similar reports of theft in the local press between the early 1880s and the outbreak of the Great War. While not attempting to excuse them, most seem to have been born out of the grinding poverty that seems to have existed on the street. A laundress at 23 was remanded for pawning various clothes which belonged to a resident of the nearby, wealthy College Park estate (12). There were thefts of a marrow in 1886 (13) and milk in 1887 (14), and several occasions of stealing lead piping including from empty houses on the street which belonged to the Finsbury Building Society the same year (15). There were, of course, alcohol related convictions too, the father and son Lustys, from 21 were together charged with being drunk and disorderly in 1887 (16). There was an off-licence at 17 run initially by Lewis White, who held the licence from 1879 to 1897. He was also a ‘General Dealer’ and had several brushes with the law, including allowing purchasers to drink outside the off-licence in 1884 (17). He was charged with selling alcohol outside permitted hours in early 1887 (18). 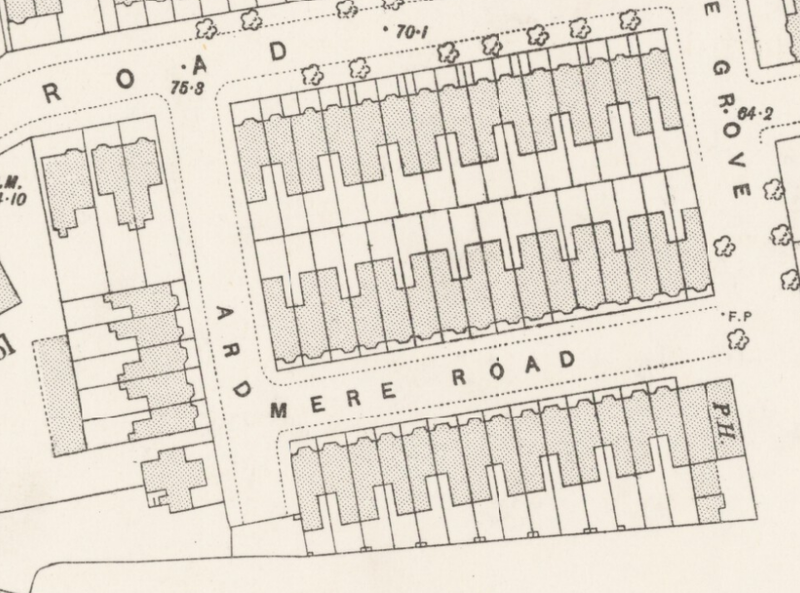 We will leave Ardmere Road early in the 20th century, the second part of the post returns to the street in 1939 and looks at the changes to the street since then. Charles Booth’s map is available from London School of Economics as a Creative Commons. This entry was posted in Lewisham History and tagged Archibald Cameron Corbett, Ardmere Road, Charles Booth, Hither Green on June 21, 2018 by Paul B.
Hither Green has a rich and interesting history; this post was written to ‘accompany’ a walk organised as part of the 2018 Hither Green Festival, it can be used to independently to walk the route (its a circuit of around 1.8 miles) or as virtual tour of the area. The ‘walk’ is divided into sections which relate to the planned stopping points – each of which is full of links to other posts in the blog which will have more detailed information. 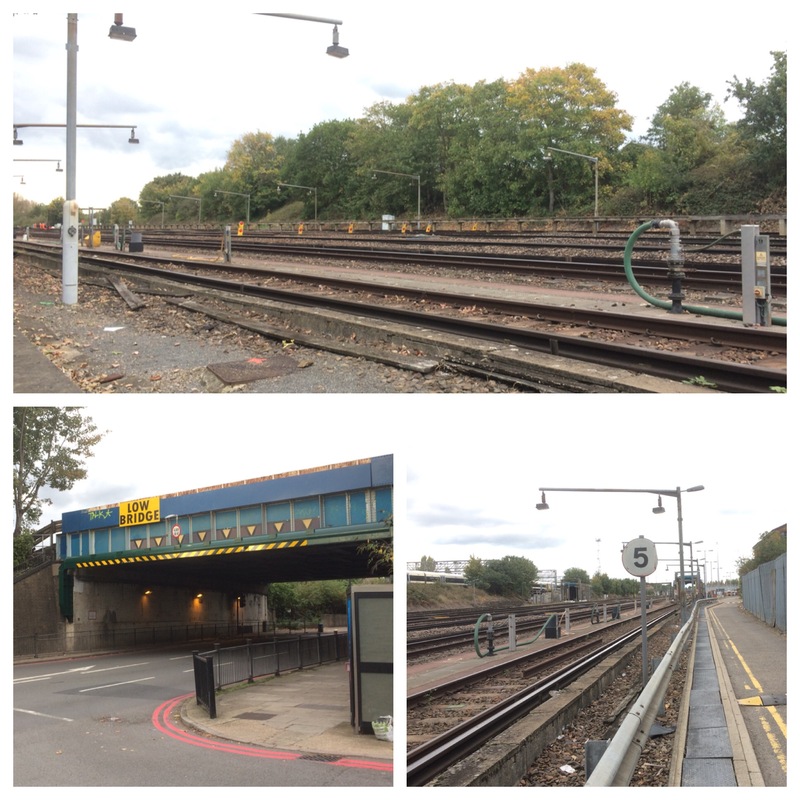 Hither Green station is the perfect place to start the walk as the railway ‘made’ the area. 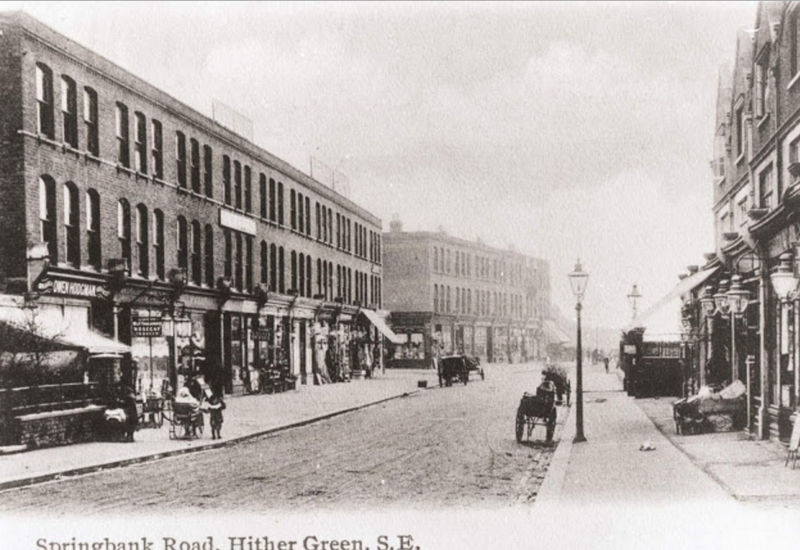 At the time of the railway arrived in Hither Green in the 1860s, it didn’t stop – it was to be a junction until the mid 1890s. 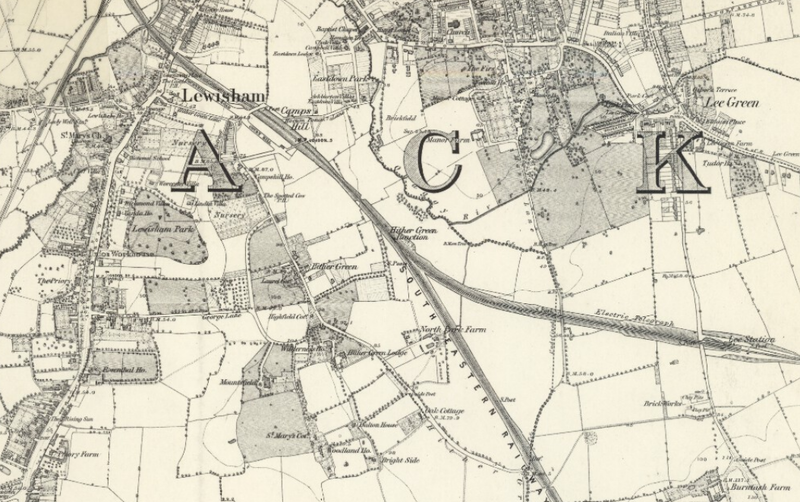 When the South Eastern Railway navvies constructed the embankment and cutting through the area, Hither Green was largely rural, surrounded by farms as the map below shows – the farms including several covered by Running Past – North Park, Burnt Ash and Lee Green. Hither Green Lane was there with several large houses but the main population centres were outside the area – the elongated Lewisham stretching all the way along what is now the High Street and Rushey Green, the three parts of Lee – Lee Green, the area around the church and Old Road, the latter with the Manor House and the farm and servants housing of Lee New Town. While Hither Green remained a junction until the 1890s, the edges that were closer to other stations started to be developed – for example Courthill Road started to be developed from 1867, Ennersdale Road during the 1870s. Then roads like Brightside, Mallet and Elthruda were developed in the late 1870s and early 1880s. 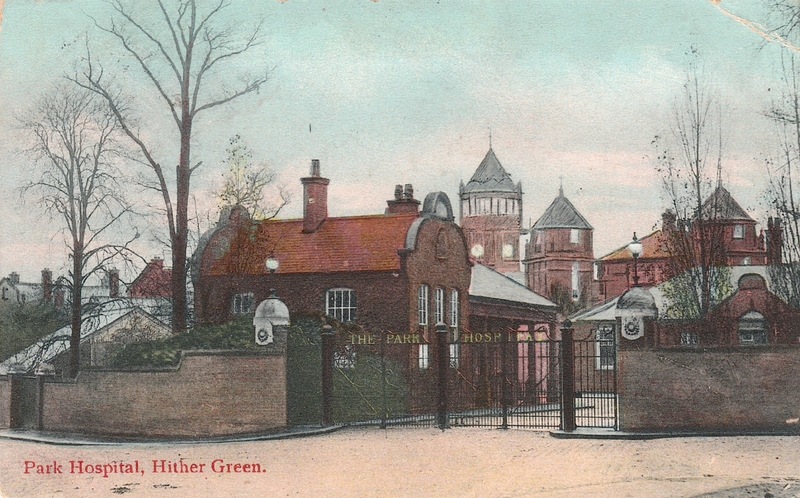 Everything changed with the opening of Hither Green Station on 1 June 1895 – the area lost its rural feel, most of the remaining large houses were sold and the Victorian and Edwardian houses and ‘villas’ built. The Prime Meridian is crossed and marked in the pedestrian tunnel at Hither Green station, most of the walk will be in the western hemisphere..
A V-1 attack on devastated the area on the western side of the station on 29 July 1944 killing five and destroying a significant number of homes, as the photograph (below) from the now closed ramp up to Platform 1 shows. It was one of 115 V-1 rocket attacks on Lewisham that summer – the most devastating had been the previous day when 51 had died in Lewisham High Street. Soon after the war nine prefab bungalows were put on the site; with the council bungalows probably appearing in the early 1960s. The Beaver Housing Society homes on the corner of Nightingale Grove and Ardmere Road also replaced some of the homes destroyed – there are glazed tiles naming the landlord which is now part of L & Q Group. 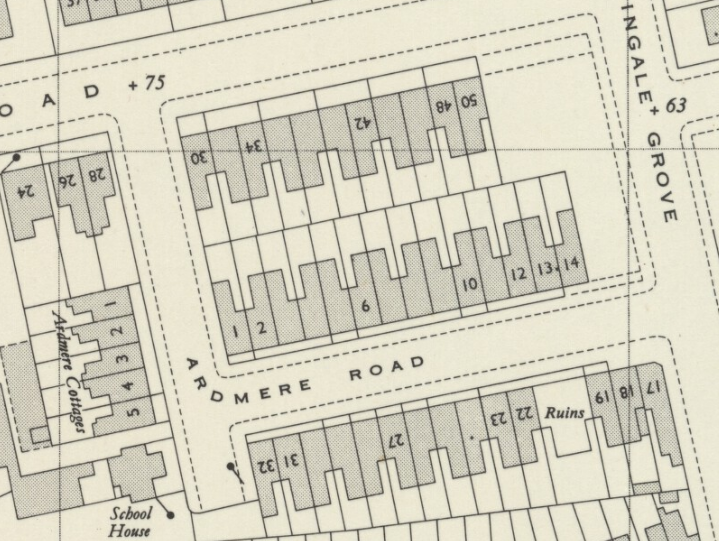 Ardmere Road was built in the 1870s but was considered one of the poorest in the neighbourhood by Charles Booth’s researcher Ernest Aves in 1899 – he described it as one of the ‘fuller streets, shoddy building, two families the rule.’ It was marked blue – one up from the lowest class. The area was looked unfinished to Aves and there was even a costermonger living in a tiny tin shack with their donkey on the unfinished Brightside Road in 1899, along with a temporary tin tabernacle. This immediate area was very poor and in ‘chronic want’ compared with the comfortable middle class housing of much of the rest of the area. The Community Garden dates from 2010 – cleared and maintained by volunteers from Hither Green Community Association. The Community Garden would have been part of the farmyard for North Park Farm. It was latterly farmed by the Sheppards, although the land was owned by the Earls of St Germans until the sale to Cameron Corbett in 1895 – there are already posts on both the farm itself and in the early days of the development. 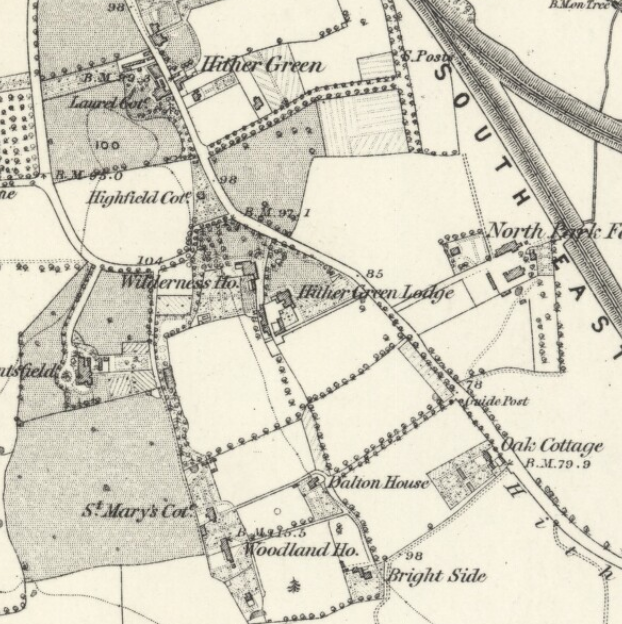 There were two Sheppard brothers both of whom had houses – one of the farm houses remains at the junction of Hither Green Lane and Duncrievie Roads (see above) – along with their long term farm manager William Fry, who lived in the original farm building around the Community Garden.. The shops (see below) were developed by Corbett early in the development – there was no pub as Corbett was a strict teetotaller. 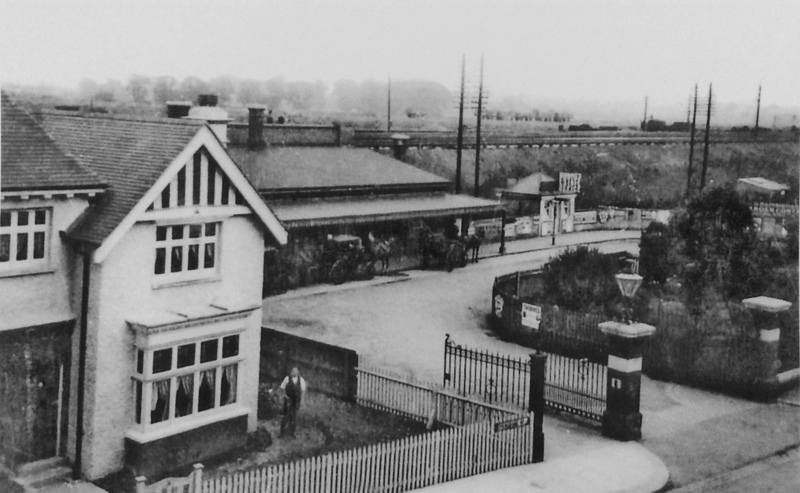 There was a beer house (licenced to sell beer bu not wines or spirits) nearer the station in area demolished by the V-1. There was a small stream which I have called North Park Ditch which ran through the farm – it is visible in the Hither Green Nature Reserve and was a tributary of Hither Green Ditch, which joins the Quaggy between Manor Lane and Longhurst Road. The original entrance to the station was where Saravia Court , a block of housing association flats built around 2013, is now situated – it is named after the original name for Springbank Road. The station buildings lasted until around 1974, when the booking hall was moved to its current location at platform 4½. The site was used by timber merchants for many years. 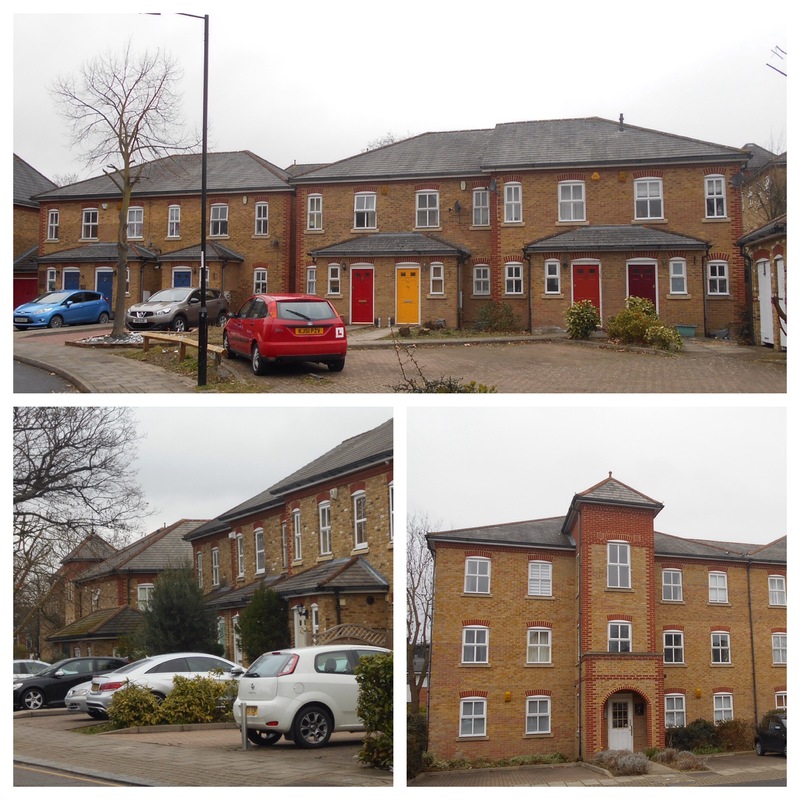 This was the site of two of Hither Green’s larger houses – Hither Green Lodge and Wilderness House, these were sold to a private developer in the early 1890s and then onto the Metropolitan Board of Works who built the hospital after much local opposition. Despite the 1896 signs, the hospital opened in 1897, it went through variety of guises including fever, paediatrics, geriatrics in its century of use. The site was redeveloped for housing after the hospital closed in 1997. There is a specific post on the the hospital and the housing before and after it in Running Past in early 2018. 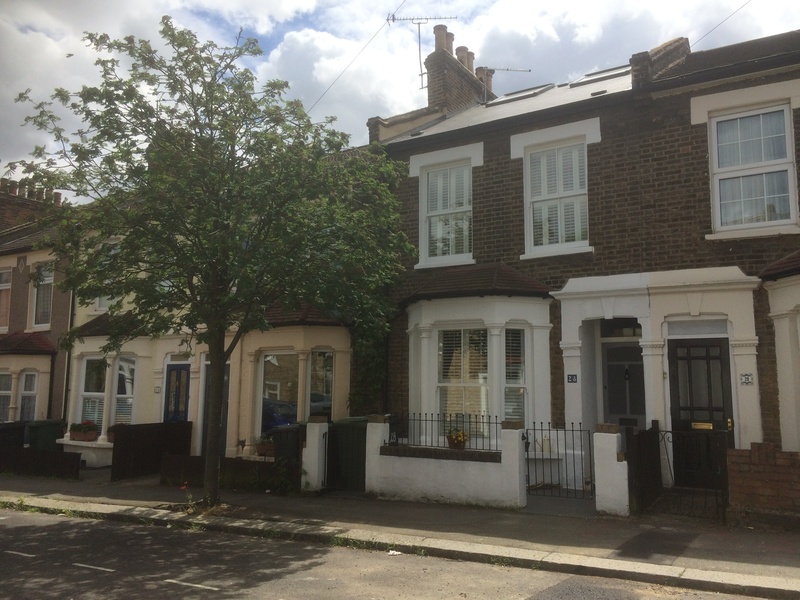 Opposite the hospital in Hither Green Lane was the childhood home of Miss Read – she was a popular writer of rural fiction in the mid 20th century, who covered her time there in the first volume of her memoirs. Roughly the same location was the ‘home’ to Rumburgh (other spellings are available) a settlement that seems to have died out as a result of the Black Death in the mid 14th century – this was covered a while ago in the blog. 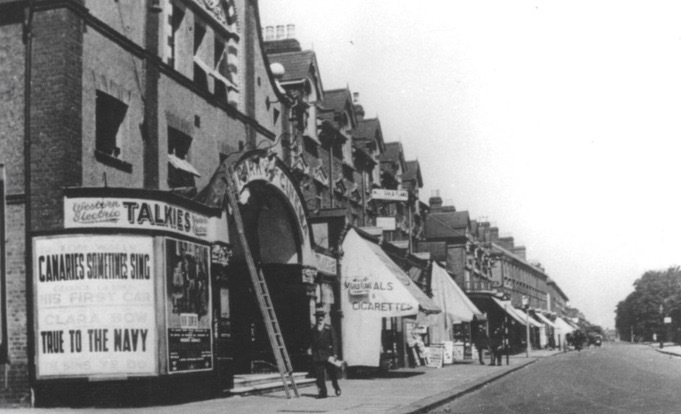 Park Cinema opened in 1913 with a capacity of 500, it is one of several lost cinemas in the area. It closed its doors in 1959 and was vacant for many years – it has gone through several recent uses including a chandler – Sailsports, a soft play venue Kids’ Korner and latterly another alliteration, Carpet Corner. 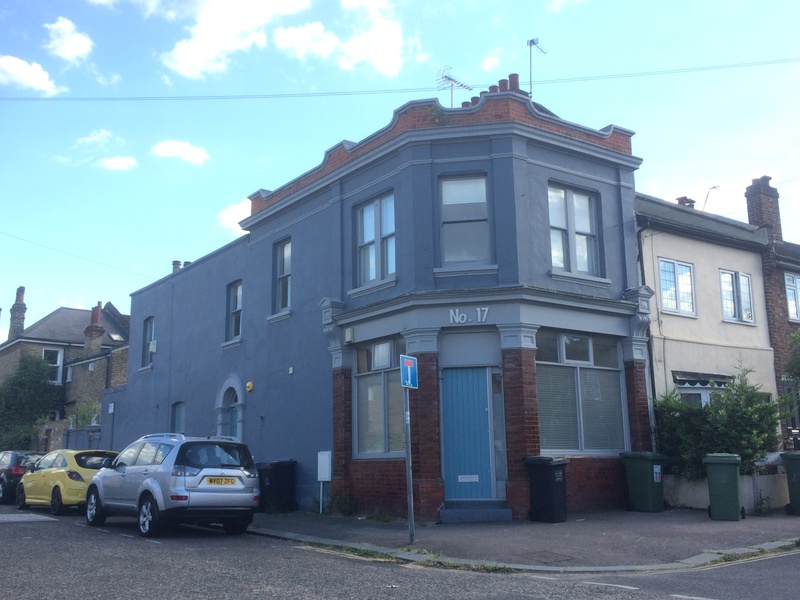 Its days seem numbered as a building as after several unsuccessful attempts to demolish and turn into flats – planning permission was granted in September 2017 after an appeal against a refusal by Lewisham Council. The Café of Good Hope is a recent addition to the Hither Green Lane, part of the Jimmy Mizen Foundation – Jimmy was murdered on Burnt Ash Road on 10 May 2008. The charity works with schools all over the United Kingdom, where Margaret and Barry Mizen share Jimmy’s story and help young people make their local communities safer, so they can feel safe when walking home. This was very briefly an off licence, there is a photo of it but it didn’t seem to last long enough to make local directories. There is much more on the brewery behind the ghost sign in a post here. The church building dates from 1904, although the now church hall was used as a church from 1884. Both were designed by Ernest Newton who also designed the Baring Hall, the original Church of The Good Shepherd and Lochaber Hall. Gladys Cooper, the actress was baptised here. Perhaps the biggest surprise with St Swithun’s (pictured above) – is that it is still here. 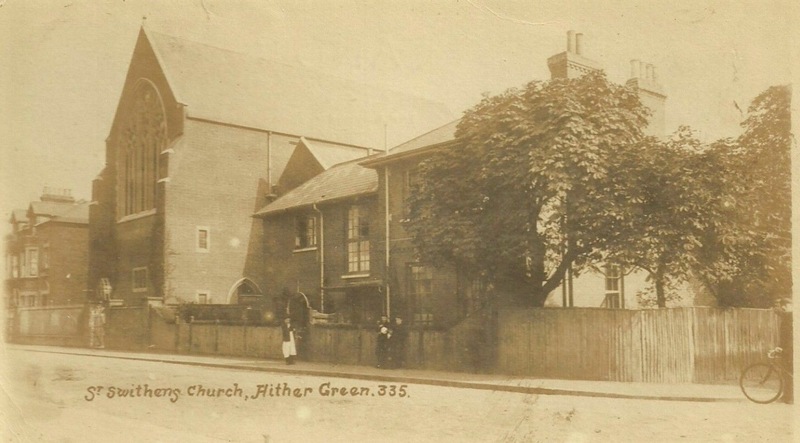 So many of the local churches were lost in World War Two – the Methodist Church at the junction of Hither Green Lane and Wellmeadow Road, the original church of The Good Shepherd, Christ Church on Lee Park and Holy Trinity on Glenton Road. Merbury Close was developed as a sheltered scheme for the elderly in 1986. 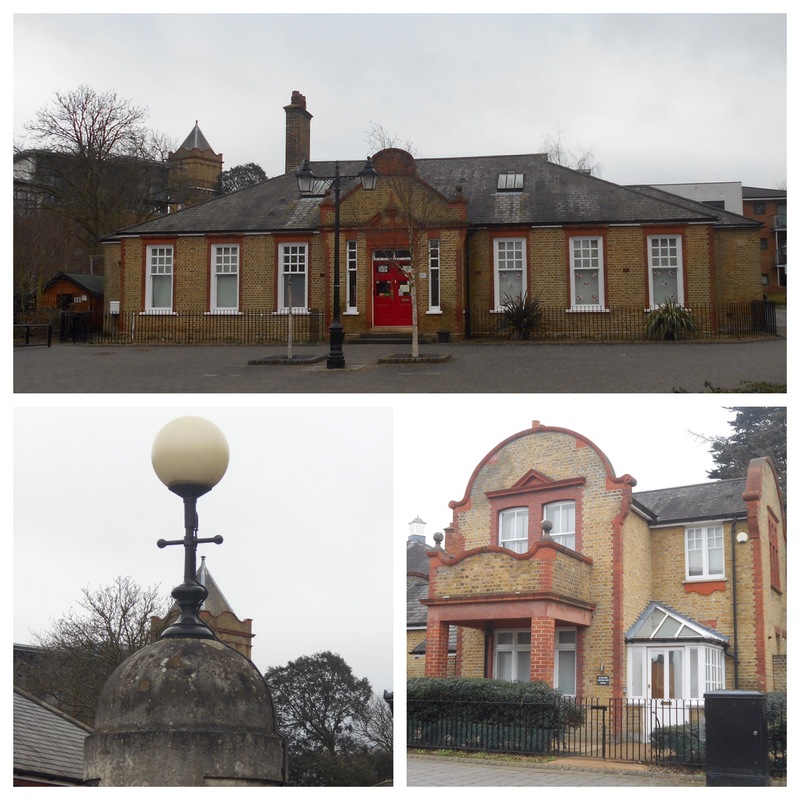 Before that it had been a nursery – the last remnant of something that this end of Hither Green had several of – the best known – run Lewisham Nursery, run in its later years by Willmott and Chaundy, which finally closed in 1860. 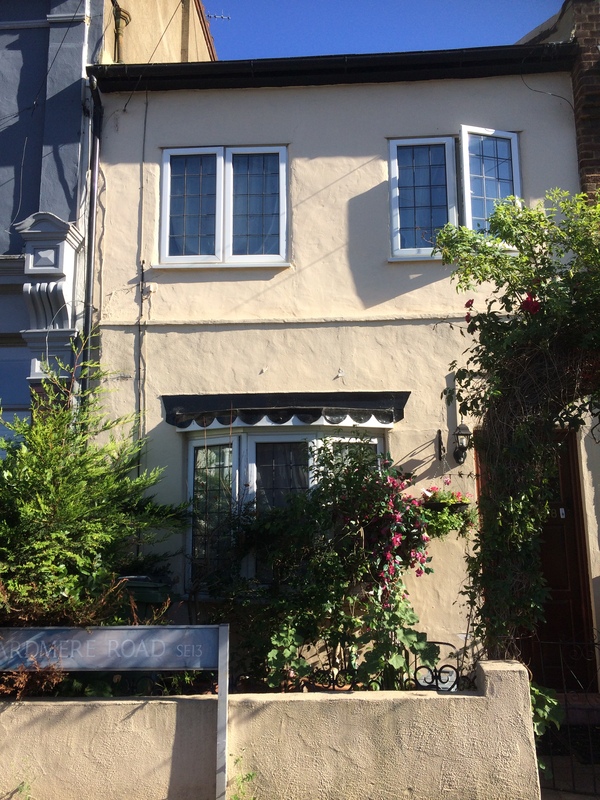 Bullseye or Japes Cottage – (pictured above) was on the corner of Harvard Road and Hither Green Lane – it was the gardener’s cottage for one of the larger houses on Hither Green Lane – the inappropriately named, in terms of size, Laurel Cottage. Spotted Cow – one of the older pubs in the area, the name referring to its rural past; it closed around 2007 and was converted into flats by L&Q Housing Trust, the block at the side is the name of one of its former Chairs. 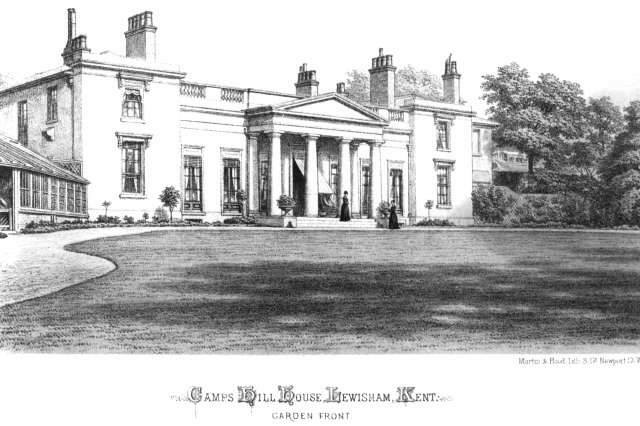 From the 1820s to 1940s this was ‘home’ to Camps Hill House, an impressive large house which was built in the 1820s for the brick maker Henry Lee – it is pictured below (source eBay October 2016) . It was demolished post-war for what initially called the Heather Grove estate. There is a much fuller history of both the estate and its predecessor in a blog post from 2016. The monument on the grass is something of a mystery – it is dated 1721, well before Campshill House was built – it is rumoured to memorial to an animal – it isn’t marked on Victorian Ordnance maps, although seems to have been there from the mid-19th century. One of the more depressing sites (or sights) on the walk is the rapidly decaying former pub, it was once one of half a dozen Hither Green boozers, despite Archibald Cameron Corbett preventing them on the former North Park Farm. Hither Green now has just one pub, the Station Hotel along with the Park Fever beer and chocolate shop opposite on Staplehurst Road which offers some limited seating. A 2016 blog post tells the story of the pub. There was an attempt to build a pub in the late 1870s in Ennersdale Road, however, there were two rival builders and they seemed to expect the magistrates to decide on which one to allow. In the end neither happened (1). The path over the railway to here used to be called Hocum Pocum Lane (covered a while ago in Running Past), it can be followed back to St Mary’s and beyond towards Nunhead and continues down the hill over a long established bridge over the Quaggy and then north along Weardale Road to join Lee High Road by Dirty South (formerly the Rose of Lee). 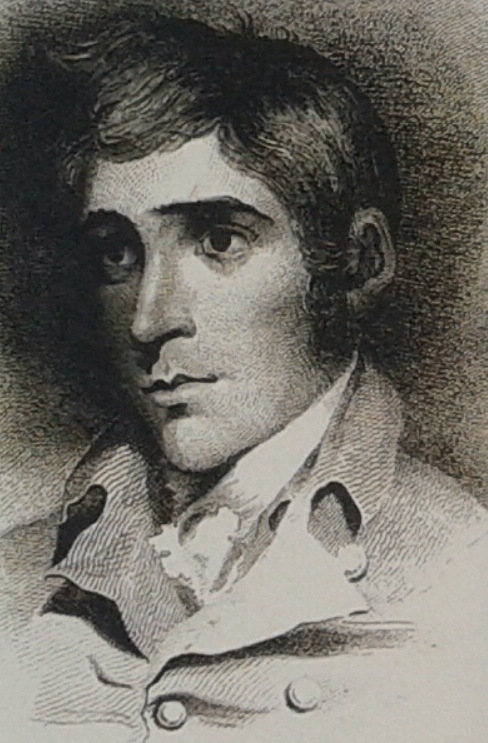 It was renamed Dermody Road after an alcoholic Irish poet in the 1870s – Thomas Dermody (below) is buried at St Mary’s and there is something on his short life here. Towards Lewisham the street layout evolved in the early 1870, the area was certainly included within the Lewisham Nursery of Wilmott and Chaundy who grew Wisteria amongst other plants, although the name of the road may predate the nursery. The area beyond this, towards Lewisham, was developed as the College Park Estate in the 1860s. This was a pig farm before being turned into a park in the 1960s, although it was once of Lewisham’s more neglected parks until a major upgrade in 2007 with Heritage and Environment Agency funding the river was opened up park and the park re-planted to encourage wildlife. There are Running Past posts on both the Park and the Quaggy at this point. While going through Manor Park is a pleasant detour – we will only see the backs of the houses of Leaahurst Road. Large chunks of this end of the street, particularity on the western side were destroyed during World War 2. The bomb sites were searched extensively during a notorious 1943 child murder investigation – the murderer was Patrick Kingston, a surviving member of the family almost wiped out in the Zeppelin attack. 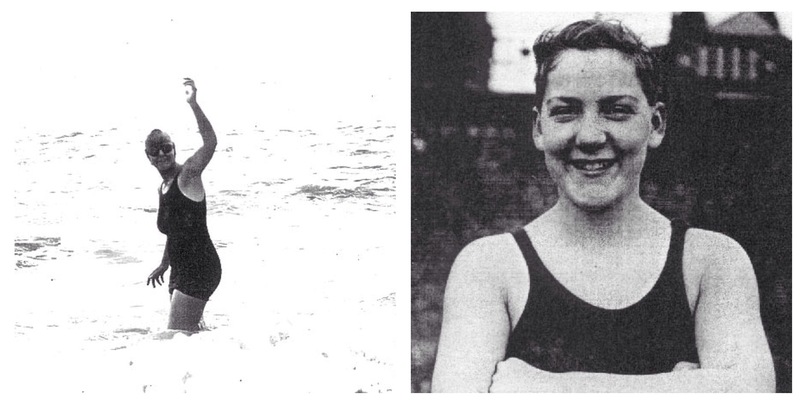 Leahurst Road was also home to one of Hither Green’s once famous residents – the early Channel swimmer, Hilda ‘Laddie’ Sharp (pictured above). The Shops were built in the early 20th century, a little later than those in Springbank Road, the dates are marked in several places as one of the original ‘Parades’ – the sign for Station Parade is still there (above the Blue Marlin Fish Bar). The nature of the shops has changed significantly – although mainly in the period since World War 2. There is more on this in a blog post, including Hither Green’s Disney store. 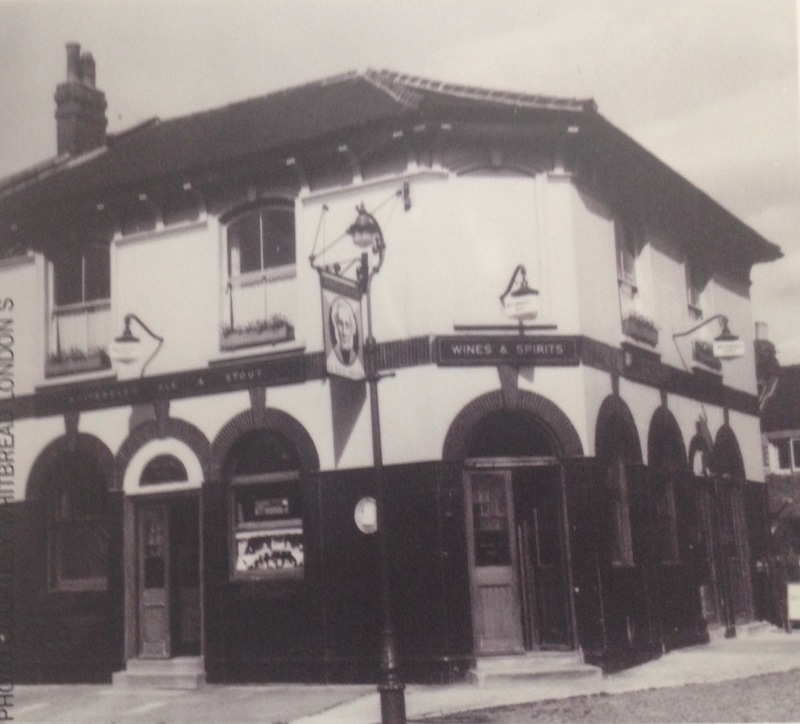 The Station Hotel was built by the Dedman family who had previously run both the Old and New Tigers Head pubs at Lee Green and opened around 1907. It is now Hither Green’s only pub. The Old Biscuit Factory is a new housing development from around 2013, the site including the building now used by Sainsbury’s was originally a very short-lived cinema, the Globe – which lasted from 1913 until 1915, before being ‘home’ to Chiltonian Biscuits. 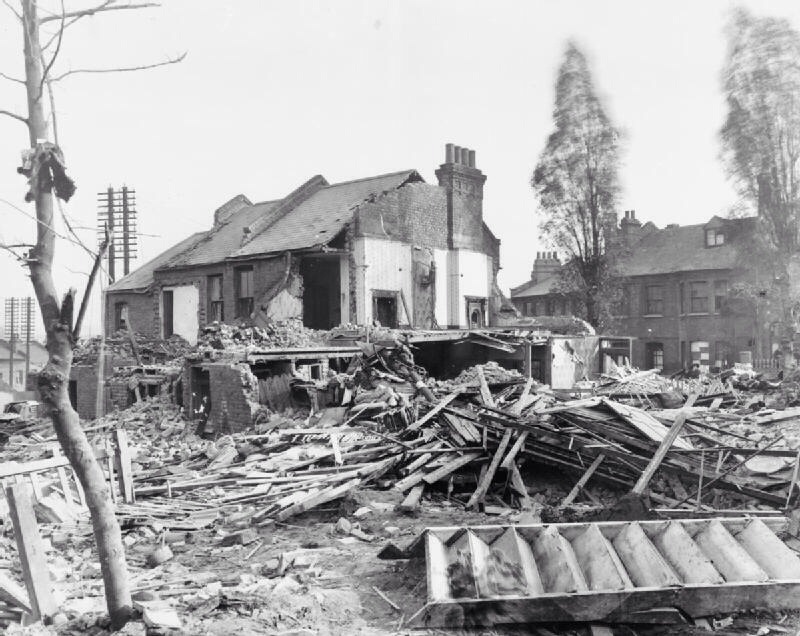 The area around Staplehurst Road suffered badly in a World War 1 air raid – two 50 kg and two 100 kg bombs were dropped by German Gotha aircraft and fell close to 187 Leahurst Road, damaging 19 shops and 63 homes, the railway line. Two soldier lost their lives and six were injured on the evening of 19 May 1918. Unlike the World War Two attacks, there seems little evidence there now of the bombing. There was more significant damage and a lot more deaths in Sydenham in the same raid. World War 2 damage is a little more obvious in Fernhurst Road, there was a small terrace built by the local firm W. J. Scudamore, which was hit by a V-1 rocket in June 1944. Prefabs were built there immediately after the war, with the present bungalows following in the late 1950s or early 1960s. If you want to do the walk physically rather than electronically …. It is about 1.8 miles long and all on footpaths, it seems fine for buggies and wheelchairs apart from one very narrow, steep uneven section on Dermody Road (although it is better on the opposite side of the road). Toilets – the only ones on the route are in Manor Park, although they are only open when the café is. Public transport (as of May 2018) – there is a bus map here, and rail journey can be planned from here. The photograph of the Sir David Brewster (Hansbury’s) is from the information boards at Hither Green Station. 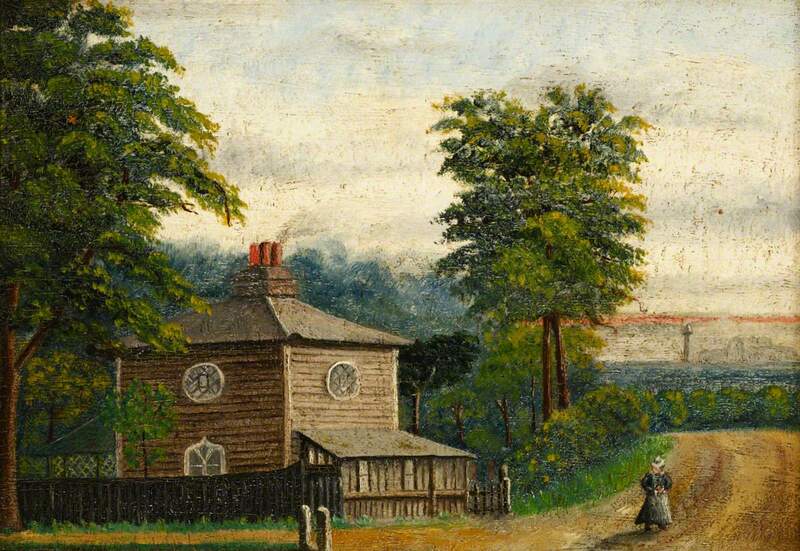 This entry was posted in Lewisham History and tagged Campshill House, Chiltonian, Glenview Road, Globe Cinema, Hansbury's, Hither Green, Hither Green Ditch, Hither Green Hospital, Hither Green Lane, Hither Green Station, Hocum Pocum Lane, Manor Park, North Park Farm, Park Cinema, Park Fever Hospital, Springbank Road, Staplehurst Road on May 20, 2018 by Paul B. The water tower is one of the more dominant features of Hither Green – it is included in the festival’s logo and a reference point for photos from the air or higher vantage points. It is one of the remaining parts of one of the bigger Victorian hospitals – which has gone by various names – although was the Park Fever Hospital for just over half of its existence. The hospital closed in its centenary year of 1997. The known history of the site goes back to the Middle Ages – as was covered in one of the early posts in Running Past, part of the site seems to have been covered by a medieval village that was probably wiped out by the Black Death. The site was home to a pair of large houses, Hither Green Lodge and Wilderness House owned by the Desvignes family (as of the road name) for many years. The map from the mid 1860s shows (1) that the area had lots of big houses – some of which have already been covered by Running Past such as the inappropriately named Laurel Cottage. The houses were sold in 1892 to a barrister who seemingly also speculated on land values. 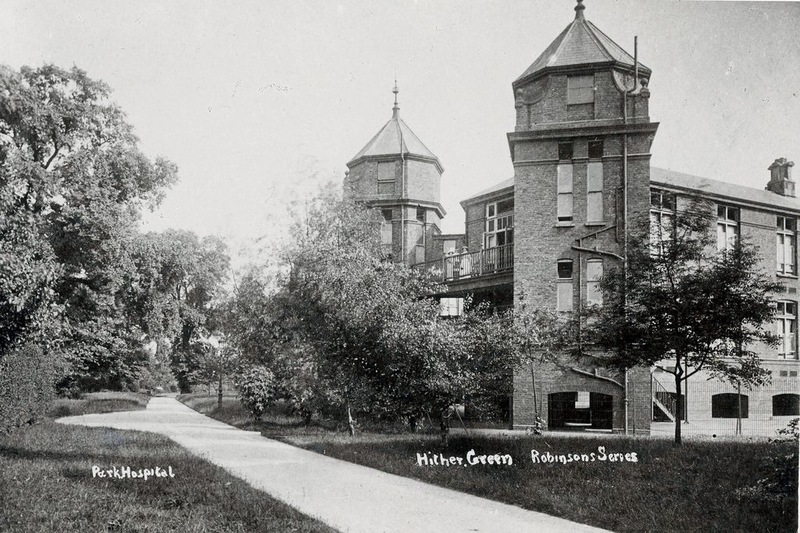 The roots of a hospital were in a Scarlet Fever epidemic in 1892/93, the health system was unprepared and there was a severe shortage of beds. It was an area overseen by the Metropolitan Asylums Board and five new fever hospitals were planned on the edge of London, including one in Hither Green and the relatively nearby Brook Hospital – covered a while ago in Running Past. Hither Green was still largely rural at the time – the station was not yet open and the neighbouring North Park Farm was still being farmed by the Sheppards. Cameron Corbett was hovering though and before the new hospital was finished, the farm was sold and early development started. 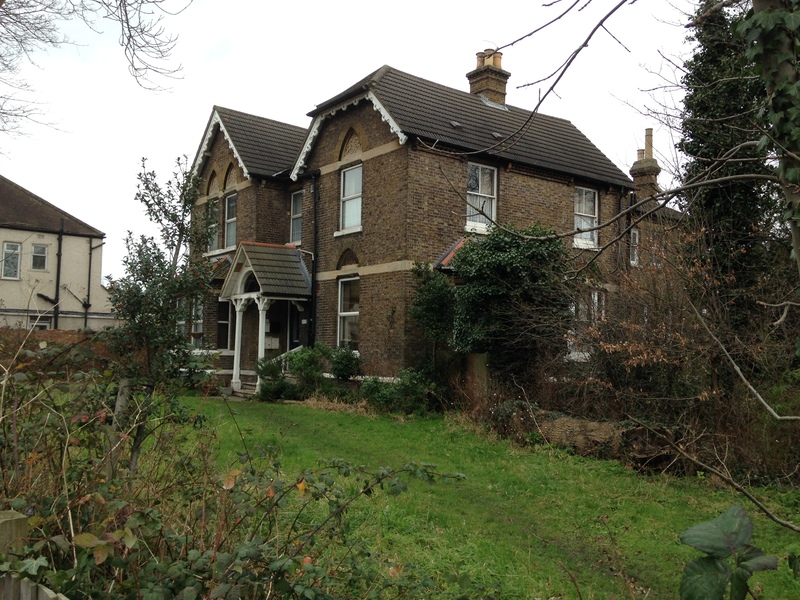 The site of Hither Green Lodge and Wilderness House, along with some adjoining land, had been bought in 1892 by the barrister Edward Boyle – he sold on to the Metropolitan Board of Works little more than a year later at a £10,000 profit (2). He also owned the site for the equivalent hospital in Tottenham, St Ann’s. Questions were later asked by a Board member about the level of profit involved and asked about whether there had been insider knowledge or corruption (3). It doesn’t seem to have led to any investigation by the Board though. However, it is just possible that’ given the site’s position on the edge of a developing city, Boyle was just a land speculator. Property values falling – there was a lot of speculation about value falling by 25 to 30% if the hospital was built – although there seems to have been no independent advice presented (or at least reported) – there were linked concerns from schools about falling rolls. The Local Board of Works grudgingly accepted the need in the area, although appears to have suggested a site that is now Oak Cottages adjacent to the cemetery, where there was an existing small hospital (5). Interestingly they were issues raised by Ernest Aves, Charles Booth’s researcher when putting together the poverty map for the area in 1899. The ‘walk’ was covered in relation to the Corbett Estate a while ago. Aves had assumed that the hospital would have had ‘a bad effect on the district.’ The local policeman that he conducted the walk with felt that it hadn’t. There was a competition for the design of the hospital (pictured above (6)) which was won by Edwin T. Hall, who was design several late 19th and early 20th century hospitals, including Manchester Royal Infirmary; although perhaps the best known surviving building he designed is Liberty & Co. store in London’s West End. The contractors were Leslie and Co of Kensington – while the tender was for £210,000 it seems that costs escalated during the project and the final bill was £280,000. As the number of fever cases declined, the hospital was briefly a children’s hospital in the early 20th century before housing war refugees during the First World War. 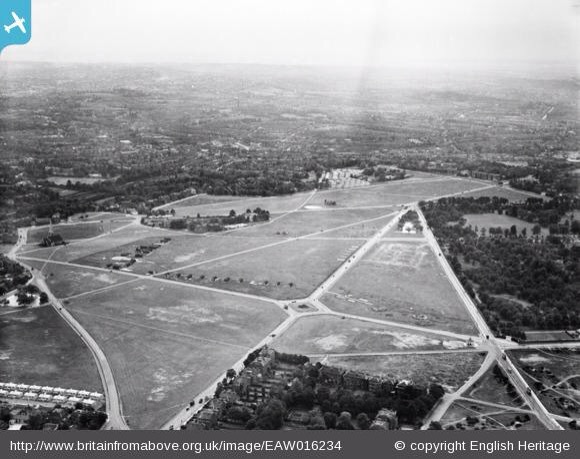 By the beginning of World War 2 the hospital was controlled by the London County Council before joining the NHS in 1948 under the Lewisham Group Hospital Management Committee, ‘Fever’ was dropped from the name at this point and it was renamed Hither Green Hospital in 1957. There was a polio epidemic in the early 1950s and a vaccine did not became available until the mid-1950s and widespread through sugar cubes until the early 1960s. 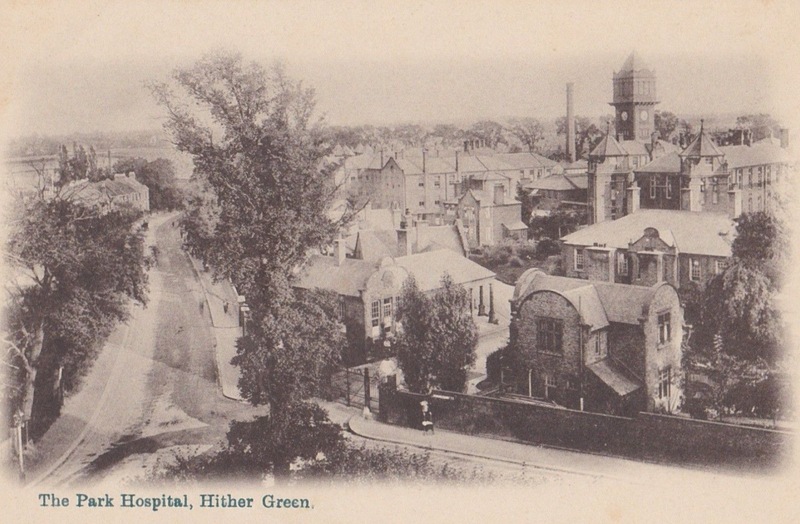 Hither Green was to specialise in the treatment of the disease and built a hydrotherapy pool. It evolved into a more general hospital, treating many of the survivors of the 1967 Hither Green rail crash, including a young Robin Gibb of the Bee Gees. From the 1970s it became a largely geriatric and psychiatric hospital but changes in the way in which both groups of patients were dealt with as Care in the Community evolved in the late 1980s. Part of the hospital was effectively mothballed in the early 1990s and in the centenary year of 1997 the last patients were transferred to Lewisham Hospital. The site was surplus to requirements for the then Lewisham NHS Hospital Trust who saw the development opportunity of the large urban site and secured a series of outline planning permissions from 1996 for housing development of the site before selling on to developers. Much of it was bought by Bellway, a large developer based in the north-east and contains over 500 homes – now ‘badged’ as Meridian South, so named as the Prime Meridian passes the very southern edge of the site and is marked in a pavement on Woodlands Street – covered a while ago in Running Past. The housing is generally low rise, particular the earlier development around the edge of the site facing onto George Lane and Stainton Road, with some higher densities and higher buildings in later phases. A few of the buildings close to the George Lane entrance remain – these include a porter’s lodge, the medical superintendent’s house, an office and discharge and waiting rooms – the latter names still visible. This entry was posted in Lewisham History and tagged Hither Green, Hither Green Hospital, Hither Green Lodge, Park Fever Hospital, Park Hospital, Wilderness House on March 28, 2018 by Paul B. The train was pretty much full, particularly at the front of the train as some of the intermediate stations had ‘short’ platforms. The train was busy enough for standing in the 1st class corridor on the fourth coach. Close to the sidings north of Grove Park, the third carriage seems to have struck a ‘small wedge shaped piece of steel that had broken away from the end of a running rail and became derailed.’ It didn’t immediately come off the track but when the coach struck some points close to St Mildred’s Road bridge (next to where Bestway is now – see photographs above), the third coach, the one ahead of it, and all the coaches behind it became completely derailed, and the second to the fifth coaches to turn over onto their sides. The first coach ran on stopping just short of Hither Green station. The coaches two to five had their sides torn off, this included the fourth coach where there were large numbers standing, there was other extensive damage to several coaches – notably coach two, whose roof was ripped off. The emergency services arrived within minutes of the accident and must have witnessed utter devastation.. There were 49 fatalities and 78 people injured – the sixth highest number of deaths in a single rail accident in Britain. Amongst those injured was a young Robin Gibb from the Bee Gees who was treated at Hither Green Hospital. He had been in the first class seats in the fourth carriage but only suffered from bruising and minor cuts from broken glass – he had been lucky – many of the deaths were those standing in the corridor to his carriage. …. Sir Stanley Raymond, the Chairman of the (British Railways) Board, was on the scene of the accident as quickly as he could be. He has informed me that the selflessness shown not only by members of the emergency services, but by ordinary members of the public, including a number of teenagers, was unparalleled in his experience since the days of the blitz. The picture the next day was of carnage, as the photographs from The Times show – the first (above) shows the extent of the damage to carriages (2); the second from close to the bridge on St Mildred’s Road shows carriages toppled down the embankment parallel Springbank Road (3) – the rendered white Corbett houses are a giveaway in terms of the location. There is also video footage from British Pathé News both from the immediate aftermath and the days after the crash. An enquiry was opened soon after and the cause was quickly found, the driver and guard were exonerated, and the findings reported upon in the press before the end of the month, with the final detailed report being published in 1968. There is a list at the end of the post of the names of the victims. There is a small brass memorial to one of the victims Dianna Williams high on the wall of the newspaper kiosk close to the ticket office. Further down the ramp toward the exits to Staplehurst Road and Maythorne Cottages is one of the Hither Green history storyboards, unveiled on the 51st anniversary of the crash, listing the names of all the victims. Many of those involved in the emergency response were to suffer considerably in the aftermath at a time when post-trauma counselling was rare. Several stories of this have come up in response to the blog – such as an engine driver based at Hither Green who helped with recovery work and had nightmares for years as a result of the horrors he encountered. He had to take early retirement from a job he loved because of his anxiety due to disturbed sleep. Other staff at Hither Green station too were traumatised by the events. Ann E. Lingham (19) Streatham S.W. The Times (London, England), Tuesday, Nov 07, 1967; pg. 8; Issue 57092. The Times (London, England), Tuesday, Nov 07, 1967; pg. 2; Issue 57092. When the post was first written it includes a request for ideas about whether there should be another memorial to the crash, perhaps nearer St Mildred’s Road. It was discussed at length with the brother of the victim named on the brass plaque and we talked about options of ‘telling the story’ better. We came to the conclusion that the then new story board about the crash did that and did it well. 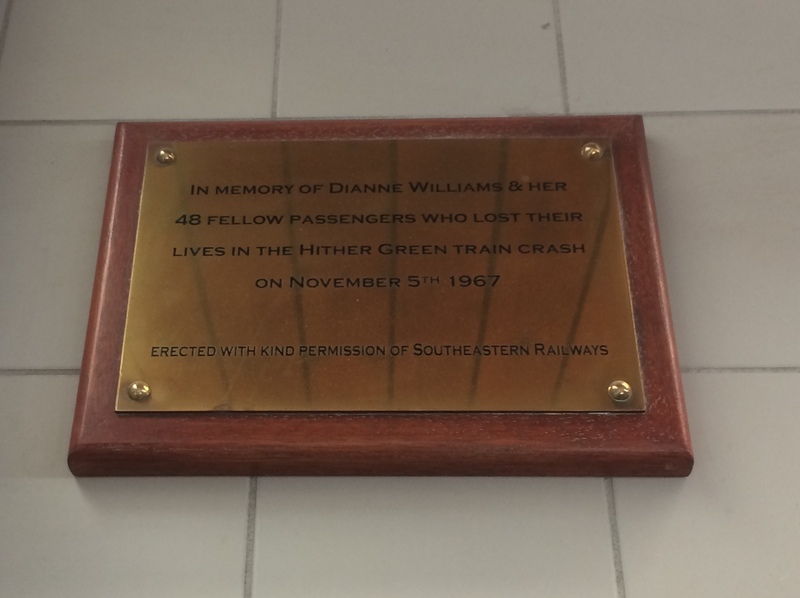 This entry was posted in Lewisham History, Uncategorized and tagged Hither Green, Hither Green Hospital, Hither Green Rail Crash, Hither Green Station on November 1, 2017 by Paul B. In Fernbrook Road, opposite the railway embankment for platform 6 at Hither Green station, there is a row of bungalows which were built by Lewisham Borough Council sometime after the Second World War. They look slightly out of place in an area of Victorian terraces, like lots of other small sites in south east London – they were not there because of any defect of the original properties but because of bomb or rocket damage. Fernbrook Road was hit by a V-1 rocket, better known as a Doodlebug, on 23 June 1944 – which destroyed several houses and caused serious damage to others. V-1 attacks had started on 13 June 1944 – a week after the D Day landings – and were to go on until October 1944 when the last V-1 site in range of Britain was captured, although there were a small number of later air launched attacks. As was noted in a post a couple of years ago on the attack on Lewisham town centre, there appear to have been some attempts to use double agents to persuade the Germans that the V-1s were over-shooting their targets and landing to the north west of London, this may explain the reasons for the volume of V-1 rockets that hit South London. The old boroughs of Croydon (171), Wandsworth (122), Lewisham (115) and Woolwich (77) were the 4 locations hit the most. The Cities of London and Westminster only received 17 and 29 attacks respectively. The V-1 exploded on impact and a blast wave rippled out from the impact point, effectively creating a vacuum in the centre – the combined impact was to both push and pull buildings leading to large numbers of collapses. The Impact was often spread over quite a wide area with total destruction in the centre with much less damage on the outside. The map above (1) shows the damage surveyed by the London County Council, the circle to the north east of the railway shows the location of the Fernbrook Road V-1 (the adjacent one, in Nightingale Grove will be covered in a later post). The terrace of homes it hit was probably built by W J Scudamore and Sons – certainly the houses either side of those destroyed have the same square bays and details to others locally. The extent of the devastation is clear – destroying or damaging beyond repair the immediate area but causing significant damage to the shops on Staplehurst Road and the houses behind, on Leahurst Road, along with some blast damage to the Station Hotel. Not showing on the map, there was also some damage to the Dartford Loop line (2). There were 22 injuries (3) and two deaths in the attack on Fernbrook Road – Marjorie Annie Lewis and her father, George Samuel Atkins at 22 Fernbrook Road. Marjorie was 29 and listed as a Clerk in the 1939 Register, George was a Butchers Office Manager in 1939. George would have been survived by his wife Lily – a Lily Atkins of the right age remained in Lewisham until her death in 1959. Marjorie had married Francis Lewis who was a Railway Porter after war broke out. 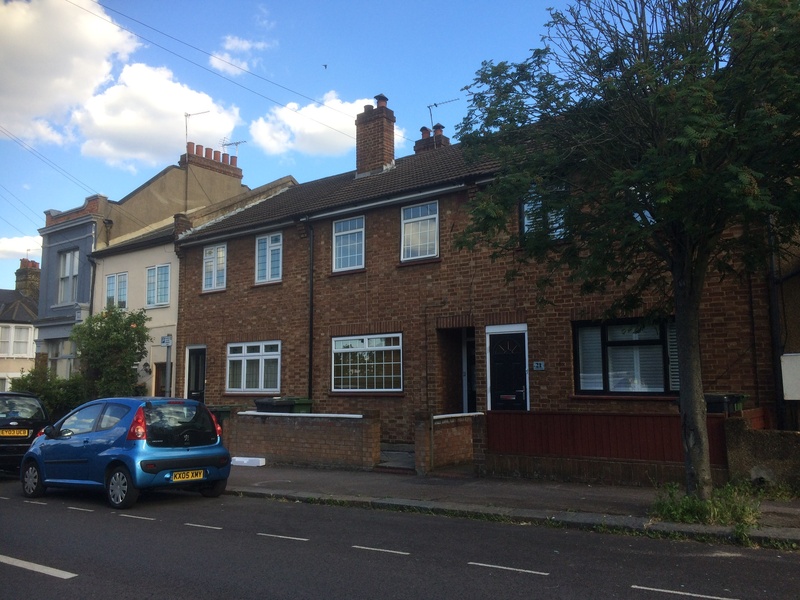 Francis was living further down Fernbrook Road at 64a in 1939 with his parents and sister. It isn’t clear whether Francis had moved into 22 after their marriage or Marjorie was just visiting her parents at the time of the attack. They weren’t the only World War Two civilian deaths in Fernbrook Road – Joyce Jones of 100 was to die a month later at Lewisham Hospital probably a victim of a later V-1 which hit there on 26 July 1944 and Henry Munyard from 106 who died in an attack on the London Power Station, along with eight of his work mates on 11 July 1944. 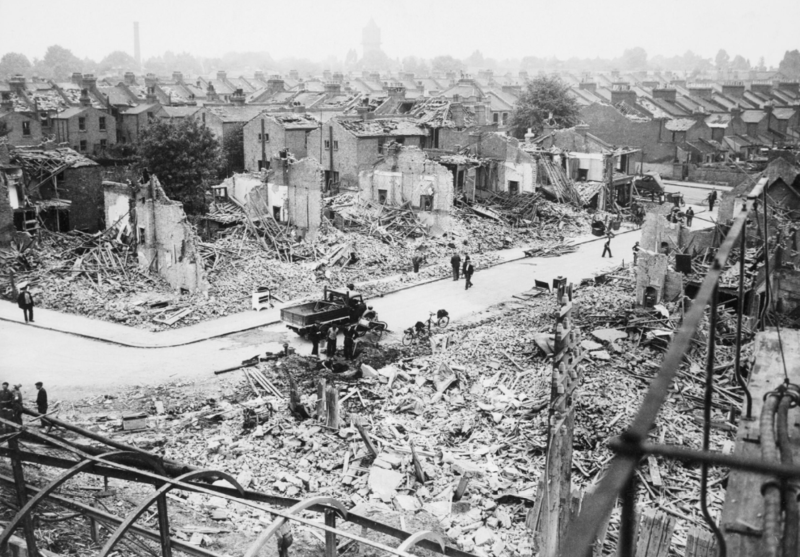 The Blitz, the ‘Dooblebugs’ and the later V2 rocket attacks had destroyed thousands of homes in south east London, leaving considerable numbers homeless. One of the responses was the Housing (Temporary Accommodation) Act 1944, which planned to deliver 300,000 prefabricated homes over 10 years, within a budget of £150 million. The temporary homes were designed to be quickly put up and last 10 years while more permanent solutions were found. Only half of that number was ever delivered due to a combination of costs being greater than expected and higher than traditional brick homes, and public expenditure cuts after 1947. The old Borough of Lewisham put up 1,610 prefabs by 1948 and a further 1,088 by 1955. Many went up on parks and open spaces – the most obvious location for this was on the edge of Forster Memorial Park, the Excalibur Estate (see picture above – taken in 2014), which Running Past covered in one its earliest posts; but there were there were several dozen around the edge of Hillyfields, where they remained until the 1960s, along with several locations on Blackheath (source Britain from Above on a Creative Commons). Many bombsites were cleared too, including on Boone Street in Lee. Fernbrook Road was another of these sites – the 1949 OS map (on a Creative Commons from the National Library of Scotland) shows them marked. One of the families who lived in the five prefabs in Fernbrook Road was the Beech family, they had lived there before the V-1 rocket attack. The attack was recalled by Margaret (see comments below) who had been evacuated to Wales the week before the attack. Her mother and older sister were in a Morrison shelter when the rocket hit three doors away and miraculously they survived. They moved to relatives in Mottingham for the remainder of the war, returning to Fernbrook Road when the prefabs were built. 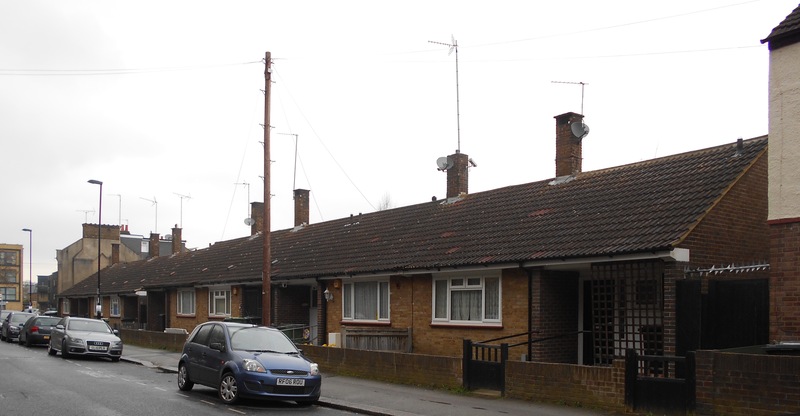 Unlike the prefabs of Excalibur, those in Fernbrook Road were relatively quickly replaced with bungalows, and a couple of houses at the southern end, probably in the late 1950s with a pair of semis at the far end of the new bungalows. The marriage and 1939 Register data comes via Find My Past, the details of the deaths are via the Commonwealth War Graves Commission. This entry was posted in Lewisham History and tagged Fernbrook Road, Hither Green, Prefabs, Staplehurst Road, V-1 on May 4, 2017 by Paul B.